Angelo D. Sanchirico, Jr., on January 24, 2019, age 86 of Haddon Heights, NJ. 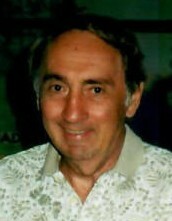 Beloved husband of the late Theresa P. Sanchirico (Nee Saputelli). Dear father of Dave, Sr. (Pat), Christopher, and Gary (Bridget) Sanchirico. Loving grandfather of David, Jr., Jenna, Sean, Domenic, Neil, and Vittoria. Angelo was a Korean War Navy Veteran. He was employed for many years at Stone And Webster of Cherry Hill, NJ. Relatives and friends of the family will meet for his viewing and funeral on Jan. 29, 2019, Tuesday morning, from 9:30am to 11:00am and Funeral Mass will follow at 11:00am Tuesday all at St. Joseph The Worker Parish at St. Vincent Pallotti R.C. Church, 901 Hopkins Rd, Haddon Twp., NJ 08033. Interment New St. Mary’s Cemetery, Bellmawr, NJ. In lieu of flowers, the family prefers memorial contributions in Angelo’s memory to The Foundation For Sarcoidosis Research at “stopsarcoidosis.org” or 1820 W. Webster Ave. Suite 304, Chicago, IL 60614. Arrangements by BOCCO of Cherry Hill.